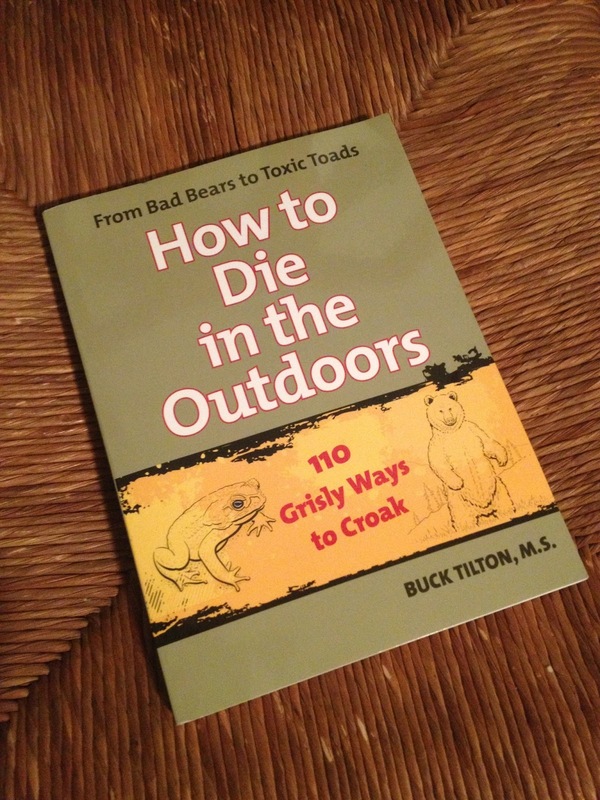 “How To Die In The Outdoors” by Buck Tilton, M.S. If you’re looking for a good read about survival in the outdoors, there are plenty of books out there that discuss anything from poisonous plants, vicious animals, and natural pitfalls. But reader beware! Many of these books read like a dictionary and can be somewhat monotonous and dull. Then I stumbled upon “How To Die In The Outdoors” by Buck Tilton. The introduction is a great opening to the read. The author, a wilderness medicine expert and columnist for Backpacker magazine, presents the ten most common ways people bit the dust in 2007. As Buck Tilton so eloquently puts it, “Basically, if you live a normal, boring life like most everybody does, staying indoors most of the time, spending your leisure hours involved in activities that do little or nothing to promote health, you have an excellent chance of ending up somewhere on this list.” (I love that.) He then goes on to present 110 ways to die, and overcome death, in the outdoors. Each chapter’s opening paragraph gives great background and information on the crisis at hand. Most situations deal with animals, insects, and other living creatures that could snuff out your candle. There are also chapters on natural disasters, poisonous plants, bacteria, and more. You’ll be amazed at the amount of knowledge and information you’ll gain as you read each chapter. The next section explains “Why You Die” and what symptoms, difficulties, and maladies you would experience in each situation. The best way to avoid or overcome these misfortunes is to understand the what’s, why’s, and how’s that are presented in this section of each chapter. If I know what a rattlesnake bite does to me physically, or what symptoms to look for which are caused by lyme disease, I will know how to treat it and hopefully stave off death. The final paragraph of each chapter is about what you need to do “To Live”. These tips are what will keep you alive if you are stung by a jellyfish, get hypothermia, or are lit up by lightning. 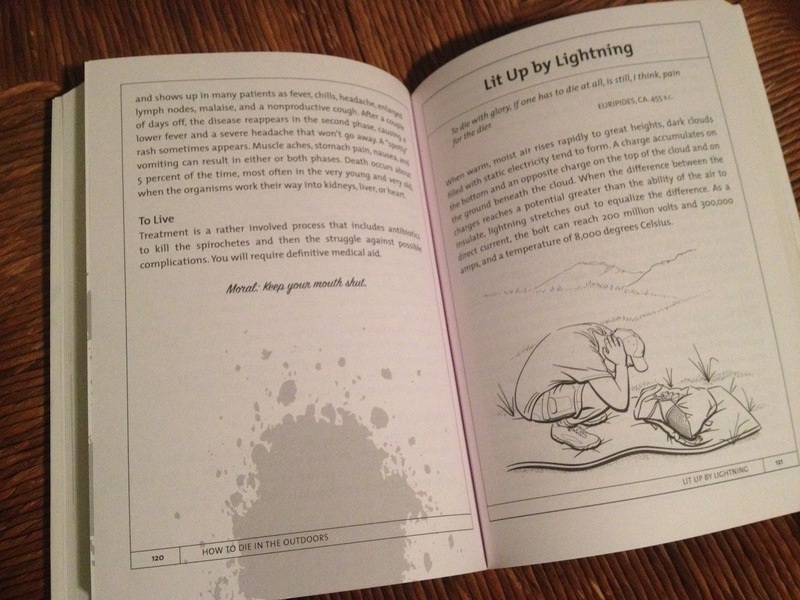 Some “To Live” sections are very descriptive and instructional, while others are more direct and simple: “Get to a hospital as soon as possible.” Once again, this is a survival book with great information to overcome the dangerous situations you might come across in the outdoors and what can save your life. And to end each chapter on a smile and a chuckle, there is a “Moral” to every story! “How To Die In The Outdoors” is a refreshing, entertaining, and enjoyable way to learn about the dangers of the outdoors in all environments and how to avoid them or overcome them. Look for this in any outdoor store or online. You’ll be glad you did.